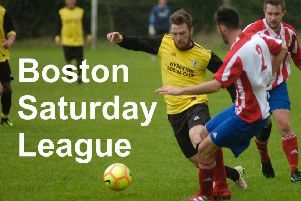 Workforce Unlimited Premier Division (KO 6.45pm): Ruskington Rovers v Coningsby (P. Stimson). BB Insure Willoughby Cup, final (KO 7pm - at Boston Town): Railway Reserves v Skegness Town A (T. Sharrock, R. Dungworth, C. Forbes, D. Bierley). Workforce Unlimited Premier Division (KO 6.45pm): Billinghay Athletic v Swineshead Institute (S. Gillespie). Sharman Burgess Sports Cup, final (KO 7pm - at Boston Town): Benington v Kirton Town (M. Thomson, S. Fisher, M. Bruntlett, I. Ruddock).